Subaru recalls the new 2018 Forester Black Edition due to the incorrect information listed on the tire certification label. 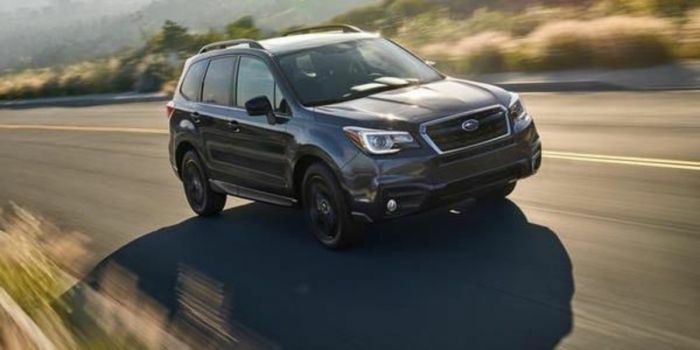 The National Highway Transportation Safety Administration (NHTSA) says Subaru of America is recalling certain 2018 model year Forester 2.5i Premium Black Edition models, due to the incorrect information listed on the certification label. The 2018 Forester 2.5i Premium Black Edition comes equipped with special 18-inch black alloy wheels and the NHTSA says the certification label incorrectly lists the wheel size, tire size, and tire pressure applicable to vehicles equipped with 17‐inch wheels. As a result, the 3,654 vehicles being recalled fail to comply with Federal Motor Vehicle Safety Standard Number 110 (FMVSS 110) regarding tire selection and wheels for motor vehicles. The remedy for this condition will involve a simple installation of a corrected label over the incorrect information. In addition to 18-inch black alloy wheels, the Black Edition features fog lights with black accent trim; black finish exterior badges and mirrors; and a front grille with blacked-out wing motif and chrome frame. New LED Steering Responsive Headlights are also included as standard. Subaru announced the new Forester late last year. The NHTSA says installing incorrect tires or applying incorrect tire air pressure may increase the risk of a crash. Subaru will notify owners, and dealers will install a corrected label, free of charge. The recall began July 26, 2018. Owners may contact Subaru customer service at 1-844-373-6614. Subaru's number for this recall is WTS-78.